The movie The Next Generation -Patlabor- was released on May 1, 2015, and its director's cut was released on October 10, 2015. 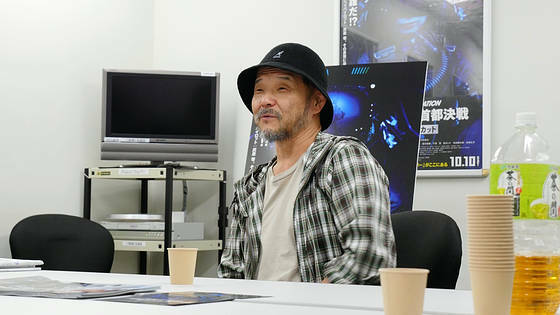 In fact, Mamoru Oshii, Director of this film and General Director of The Next Generation series, had finished the director's cut at first, and it was planned to be released. However, for some reasons, another version which runs for about 90 minutes was made and shown at theaters in May. 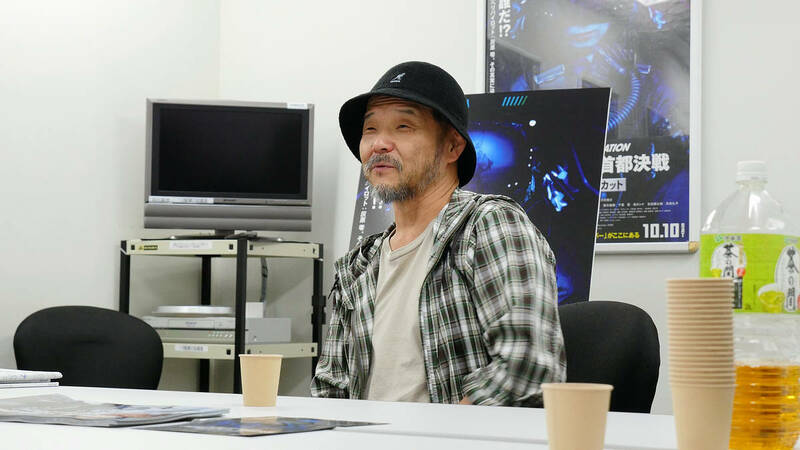 We interviewed him about the circumstances of releasing two versions of the film, and the idea of making a live-action film of Patlabor 20 years ago, and many other things. 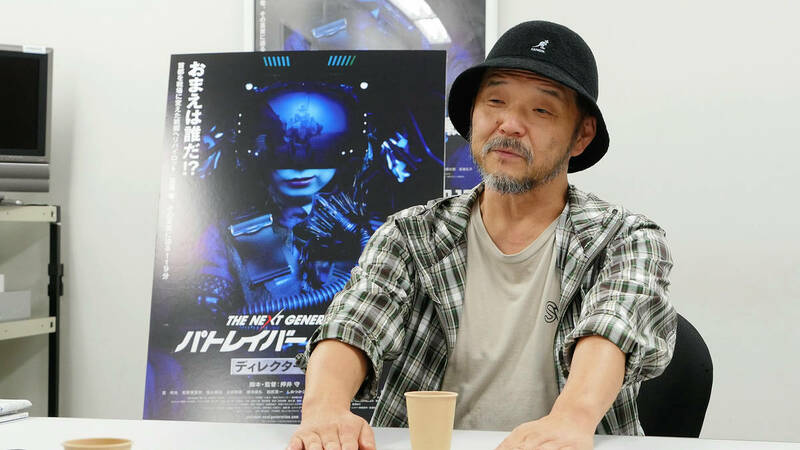 First of all, we want to know the circumstances of releasing the director's cut of The Next Generation -Patlabor-, which contains 27 minutes video that wasn't shown at theaters initially. We've created the director's cut at first, but someone mentioned that it was too long. I thought "Why do they feel that the two hours film is long? ", but they wanted to shorten the film to 90 minutes. They said that if we make a 90 minutes film, theaters can show it again and again in a day. But I think the number of people who come to see the movie will not change even if the film is short, and I think it is meaningless to show the movie many times at theaters. I thought their talk lacked a basis in reality, and I asked the detail but I couldn't see what they were driving at at all. Even if I told them "If you feel the film boring, you should say so. ", they said that it wasn't the point. Therefore I decided not to pursue. Maybe they had some circumstances. Then, the choice was to fight and quit, or not. But if I fight with them, no one will be glad. I, as a director, can fight, turn down the request, and say "I don't give way to pressure. ", but it isn't a great thing. Staff and actors will be disappointed, and there is a problem of releasing the film without Director's name. So I suggested to make two versions. They accepted to release the director's cut, so I said to them "If you ever betray me! ", haha. In my view, since we've had a long relationship, I can rely on them for it. When I said "If it is spoiled for various reasons, you'll be sorry for it. ", they responded "We'll do our best with risking our neck. ", so I rely on them. ...These are all things that I know. I made conditions that they shouldn't edit the director's cut, release it within this year, and publicize it again. I don't care the details like the number of theaters, I just want to release what I create, and the audience will judge later on. The audience may be get angry. But almost all those who see the film which was released in May will see the director's cut, too. Fans of Patlabor have had a strong sense of duty since early times, and they burn with a sense of mission and they think "We have no other chance if we don't support the series." So they go and see a movie and keen to buy goods. I'm happy if they go and see the director's cut again. For those fan, it becomes an event to come from afar to see a movie and buy goods. I've heard that they sold a large number of goods. I suppose that those who want to see the film will see it. Even if we hold a Patlabor deck up event nationwide and advertise the movie, some people don't see it because the robots appear in the movie. A same thing happens in case of anime, too. They say that "There are two kinds of people in the world: those who see animes and who don't." as a joke. Films produced by Studio Ghibli are treated as specially, so some people see them with their family, but they feel "No way!" about other animes. Speaking of this film, some people see the robot film, and others don't. Even so, all of those who have seen Transformers won't see The Next Generation -Patlabor-. From the planning stage, this film is difficult to be fit in. It's a Japanese film, but isn't similar to other Japanese films, and isn't similar to Hollywood films, either. The robots appear in this film, but this is not a sci-fi film. Although it is a story of police officers, a crime seldom occurs. Besides, the characters belong to the security department, so they never investigate a case. As you think of police films, you would imagine the story of riot police, revolution, coup d'état, or a story with social message, but some characters have a irresponsible personality in this film. These themes are in common with the animation series of Patlabor, which isn't definitely a robot anime, school anime, war story, nor Gundam appears. That is why Patlabor continued for twenty years. It still continues, and fans have still continues to buy goods. So it was difficult for me to create new film, for whom and how I should create it. Therefore, as same as Patlabor anime series, I should create what I want to create. I must think that what I want to see is what people want to see, and create things. However, The Next Generation -Patlabor- film is different from anime series in one way: the film has living feeling, but sounds a little unlikely. Seeing those balance, I'm happy if someone think that they want to work at those kinds of workplace. It seems that salary is low, business is slow and there is nothing to do during regular office hours. An incident occurs only once a month. And as for meal, only one restaurant delivers meals, or they buy foods at a convenience store. On the other hand, they can secretly drink alcohol at work, and there are beautiful ladies, too. Although there is no possibility to get along with the ladies, haha. I created the film to make people who see the film fun and pleasant. I sometimes put them in busy situation, and they put their best food forward. They don't have an outstanding performance, rather they have a terrible experience. Even so, it is important whether they look enjoyable or not. I don't think their work is hard because of their terrible experiences, since a production site of film is in the same situation. Generally, they have a terrible experience if they work at a production site. Although some people do a side job, they won't leave a production site. As long as there is a job, they can eat bento for lunch and dinner, can drink alcohol after work, and there are cute young ladies. You can go on a date with some ladies, but can't with other ladies, haha. For example, you can't date with a actress, but you can with staff in makeup or clothing department and they are frank with each other, becoming intimate or separated. Therefore, in my opinion, they never leave their workplace. Their job is full of non-ordinary things and merrymaking, on the other hand they don't know when they can sleep, or they are not sure whether they can get salary or not. I think the world of this film is similar to theirs, and decided to describe those kinds of world. It's difficult to describe it by animation. I tried to describe, but it doesn't look real. Therefore the world of anime becomes more and more attractive. Animes are turned into ardent story, robots appear and fight each other every week. It occurs after I quit anime director. I tried to change the world of anime, but I felt that spending time and keeping effor on it is difficult, since it's easy to be a hot-blooded man and take the side of justice. I tried hard to show lived-in feel in this film, making words like "I wanted to eat this cup noodle 30 minutes earlier..." So I aimed for putting it into practice first of all, shooting as a live action film. I tried to express a sizzling feeling of daily life, and a loosely like. Probably such a workplace is where people really want to work. They don't want to do same thing and stand for their work every day, or become a mercenary and go to the U.S. I think Special Vehicle Section 2 is just a good place to work. Those who work at Special Vehicle Section 2 aren't fully acknowledged, but they are sometimes thrown into the limelight. They are often criticized, but they have food, alcohol, and young ladies to date with. I created this film thinking that how far people tolerate it. I surely made an appeal to the certain type of people, but on the other hand, some people say that they feel unpleasant watching the scene which the characters eat meals at hanger. They clearly told me "It looks dirty. ", haha. Such an opinion had been allowed for to some degree. Although -Patlabor- is made into a movie, some people will see it but others won't. 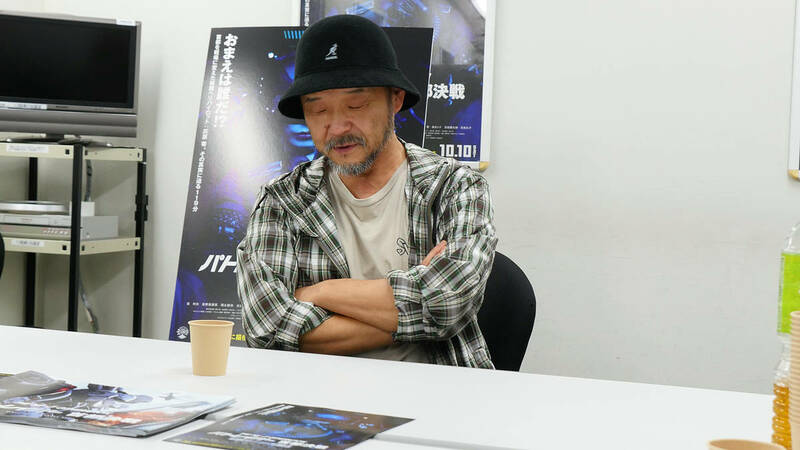 However, since the price for watching the film is not so cheap, and we get the money from audience as we release the film, we did various things. And also I decided to show a highlight well, because I like to show it. I like the scenes attacking from a helicopter, breaking in and gun fighting, so I decided to shoot those scenes completely. However, we also decided not to change the characters' life. Their personality never change, and the robots never fly in the sky suddenly. Those which move only for 3 minutes never move more than 3 minutes after all. Therefore, we could create what we imagined by and large. So, I thought it was no good to cut some scenes from the film which we finished. I said to them, "It is useless to cut those scenes, nothing will change. ", because the film won't suddenly turn into Transformer. If they cut certain scenes or words, the ratio of those scenes may change, but it is because the whole length of film is shorten. The total amount as one scene doesn't change. I think that the audience will come to see this film not because they want to see great actions of actors. Of course, they will be angry if there's no action scene at all, but I don't think things will change if they cut the certain 30 minutes from the film. But it was useless to say more than that, so we concluded to release both of two versions. I don't think that a different answer will be given by releasing both of them, but I think everyone will be happy by doing so. You've said that you made an appeal to the certain type of people. Are there certain type of people regardless of generations? I think there are. But I think that junior and senior high school students won't see this movie, because actually there were few of them when we created 7 episodes in the series before. Those who saw -Patlabor- when they were students will see this film, but saying about young students these days, it may be difficult to approach them. What do you think is the difficulty? I think they can't understand the characters, whether they are good people, or just a poor fool. The characters is bankrupt in some ways, like being an alcoholic, being crazy about pinball and deserted by his wife. Other members are strange too, like a military geek, a girl who loves a game arcade and go there straight after work, a man who only interested in chicken, and a lady who always smokes and swing about bayonets. That's because from the beginning I created the world with those kinds of people, so I don't clarify it is good or bad. I spent my energy on describing how those people will act if they are put into a corner. The audience will think "The characters are nicer than I thought." or "I will do the same thing as they do." in either way, those who can understand the characters make a living to some degree. It is difficult to understand the lived-in feel in the film for junior and senior high school students who just get up and eat breakfast in the morning and go to school. Originally, films have the role to show people the world or workplace which they don't know, like a cook, a doctor, a yakuza (a Japanese gangster), a villain and so on. I was interested in watching those kinds of world, so I went to see those films when I was in a junior high school. I detested a film describing a familiar world, like a story of school life, or a sports movie saying "Let's run towards the setting sun! ", haha. I don't want to see our daily life as a film, and moreover, I felt unpleasant that the daily life was idealized. It was more unpleasant if the life was described with reality. The plan of this film starts from the idea that "Instead of those films, the world of gangster or Science Special Search Party is better." Special Vehicle Section 2 is rather similar to Ultra Guard, but those who belong to Special Vehicle Section 2 eat cup noodles for the most part. Only after we start to make a living, we can understand the good points of those world. The characters in the film are all adults, so they can accept each other's hopeless, rough, irresponsible personalities. They can speak frankly to an alcoholic man, "You are smelly!" I can't declare that such a workplace is whether good or bad, but to sum up, it's "the adult world." In the beginning of production, I announced to make the film with a much more grownup atmosphere than the anime version. I think that it was meaningless as a live action film without such an atmosphere. If you put what you describe in anime to a live action, it becomes unpleasant like a story of high school life. I think it is the difference from the anime series. For example, officer Ota in anime series has a strong sense of justice and fire a pistol recklessly, on the other hand, officer Otawara in the film has a sense of justice as Ota but he is an alcoholic man with trembling hands, haha. I told someone that Otawara has a daughter, living somewhere. For those people, Yuma or Akira are still young and at heart they think that young people don't understand anything, but they say nothing. And simultaneously, he knows that the young two look down on him a little. However they must stay together since they belong to the same workplace. And being together, they have to accept each other in some ways. I expected that too, but as a result the ideal wasn't achieved. They feel it dirty, haha. It is surely dirty, since the characters only eat cup noodles or rice balls sold at convenience stores, and a delivery food is like a stock feed. Probably, they don't like such things, haha. Recently it seems that junior and senior high school students rather see a film describing their daily life with a story of idealized school life, which you said you don't like. I do see such a film for a bit. When I was in a high school, I didn't like such a film the most. Do the students really like those films these days? The story starts from describing a boring school life, and first of all the characters form a music band, or try to organize the light music club. The audience may be impressed by their effort, but I don't like it, haha. Because they told us a lie consequently. I think that the students should start doing something, instead of watching such films. However, -Patlabor- is a story of police, so they can't start it by themselves. But as for the film about the club activities or someone who raise his deviation value, I think the students should try to do by themselves, there is no time for watching the movies. If they see the film, an unrealistic world should be described. I think it is senseless to shoot a film unless the story lacks authenticity in some ways. However, as for the film like Space Battleship Yamato, in which people may die the next day but still talking about love, I wouldn't ride on the ship with those people, haha. I want to say to them, "Will you die for human being?" For me, I won't die for anything, so I created the world like -Patlabor-. It's an ideal for me if anything. If they think the world of -Patlabor- is dirty, there's no point in crying over. But if they go to see Birigal or such films, I think they won't change the life of the audience. Although you feel happy or you may cry, but the film won't change anything in your school life. You will tell people "That movie was great to see. ", but you may forget it in half a year. I don't know whether -Patlabor- will change someone's life or not, it's a kind of simulation. I want to show simple things like "What is to do a really funny thing? ", or "What is to live seriously? ", or "Can you really accept people next to you?" with an alcoholic man or a poor fool. I describe it in an extreme way, but speaking frankly it's a reality, so the matter is whether you can recognize the value or not. They look frivolous but serious in some way, since people don't enjoy it. It is not because they are nice because their actions are interesting, it is just an entrance and ultimately we want something that we feel sympathy as a human, or something with deep meaning. That's because everyone see movies and read novels. It can also be said to comics. Some people do such things just for killing time with no meanings, but I don't, so I just have to believe it. Although this film looks exaggeratedly, only one helicopter dropped at all, haha. They made great sacrifices for such thing, and the hanger was broken. They said "We did it! Yeah!" in the end, but I wonder what will they do from tomorrow, or they have a place to go back, They sank one Labor into Tokyo Bay, and they may be arrested if things go badly. The Labor costs billions of yen each. However, since the characters do a foolish thing in such kind of world, people feel sympathy to them. The trouble was solved, however. I tried to describe the fact "When you achieve something, you lose something." at the very limit. I think it is not a bad thing. My master said to me "It's your work to describe the world which someone wishes for." He severely told me "Tell just one thing what you want to tell, not two or three. Since you create your work using money which isn't your own, never behave in a self-serving manner. But you should think and put at least one thing that will be a lesson." In short, we should describe the world that people yearn to see, for young people. Was your master, Hisayuki Toriumi, a scary person? He was a great anime director, but he was called "Great King Enma", haha. He was a terribly scary person, as a well-aged adult was kept crying loudly. I was the first and the last pupil... no, he had lots of pupils, but almost all of them were fired and I'm the only one who survived, haha. I received his training under Tori-san... although I didn't study so much, we need a master for work. He said again and again "You are neither a writer nor anything. If you want to become a director of commercial films, anyway create a film which people pay for and they become happy. Never create a self-seeking film." A self-seeking film was which I tried to create, and I have done... and was treated severely, haha. In short, it is "a movie of self-advertisement." I was scolded every time I made such a film. If he see this film, maybe he would praise me. 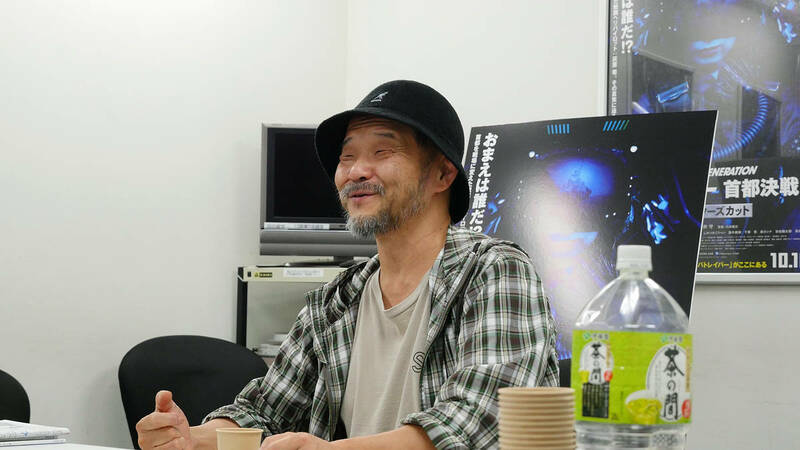 He praised me just a few times, one of those was the first -Patlabor- film. He scolded me when I made the second -Patlabor-, haha. He said "You returned what you were before." 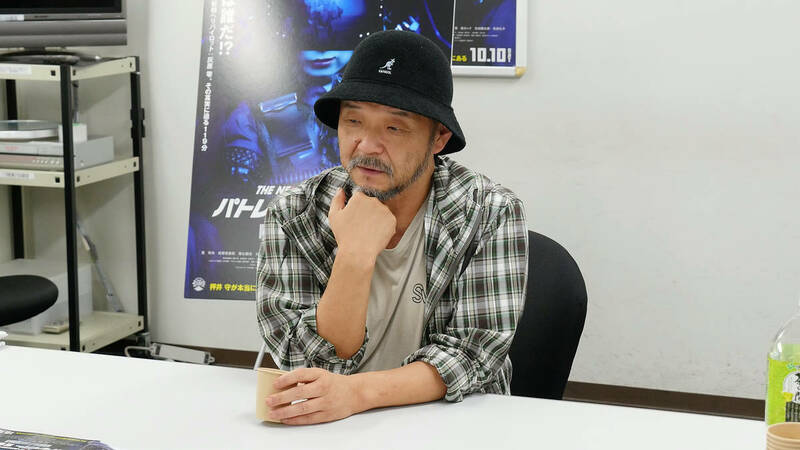 Returning to the film THE NEXT GENERATION -Patlabor-, Chief Producer Miyashita sent a message "Although this film was filled with new trials, I'm satisfied with the details, and it was great to create this film. I think that it is worthy of special mention that we let Director Oshii say 'The site of the production was fun!'" on the pamphlet when the first version was released in May 2015. Do you have any matters or episodes which you felt that the site of the production was fun? Although it is a strange way of speaking, I feel I become a little skillful. I've rather learned a great deal from the site. You sent a message on that pamphlet that the staff was the best of all live action films you've shot so far. The staff was wonderful. A Polish staff was wonderful too, but over again I appreciate the advantage of working with those who speak same language, haha. A shooting department, a lighting department, an art department... all staff was extremely great. I expressed my gratitude to the producer who gathered such a staff. I told him "Thank you for taking a good staff." 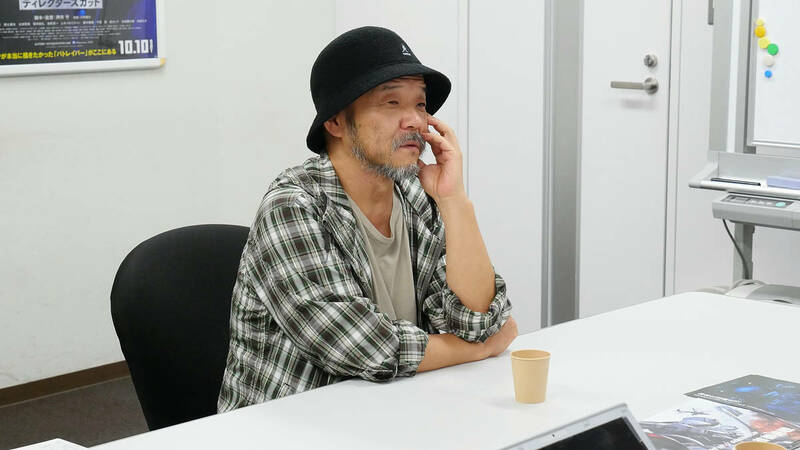 Shooting staff Machida, Art staff Anri Jojo, Decorating staff Tetsuji Tatsuta... they look forward what I want to do, and they make time to spare for the director to think. It is often difficult to achieve. It was the first time for me to have time to spare while making films in Japan. Usually I'm busy with the work and have no time to think about what I'm shooting now. "It will get dark in a few hours, and we must shoot several cuts before dark, how should we manage it!" However this time we have some time to spare, and Mr. Machida showed me what I've never seen before, like how to use a crane and a specified machine, so I'm grateful to him. At any rate, the certain thing is already prepared when I want it, how glad it is as a director. I think you can't realize the value unless you become a director. Usually there is a conversation like "I want this...", " We don't have one. ", "Why? ", "Because we neither have enough budget nor time..." every day, but during the production of this film I almost had no stress. It doesn't mean that I didn't feel any stress, for instance, when I asked them "I want two thousand extras for this scene. ", they told me "It's impossible. ", haha. But they arranged two hundred extras instead. 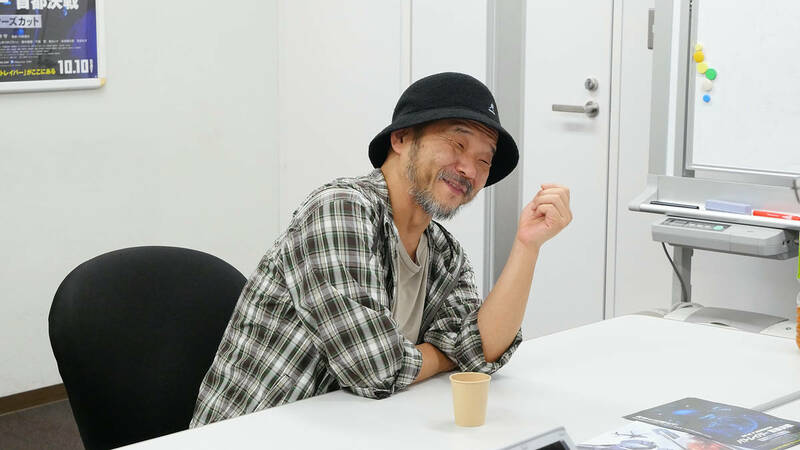 You wrote the novel TOKYO WAR, and in its postscript you noted "When I create one film, I think regretfully about "another film" which describes a plot, words, characters which we had to cut off under various situations like a balance of components, or the length of the film." How do you feel about the film THE NEXT GENERATION -Patlabor-? I don't think much of that kind of thing... but if pressed I would say that I wanted to shoot Cobra 2 and F2 a little more. I also wanted to shoot a scene of Ministry of Defense, but I gave up so I don't regret about that. And other thing... maybe that's all... I wanted to shoot a scene of Tokyo once. We couldn't borrow any places including the scene of a bridge, we could hardly ever shoot outside. That's all. The title of the film was "The final battle at Capital", but they said that the film wasn't shot at Tokyo. Yes, just a few scenes from the sky, haha. Overall, the filming trip was perfect. A bento was delicious, by the way. From 20 years ago you had an idea of making a live action film of Patlabor, and it is finally released as this film The Next Generation -Patlabor-. Besides, Garm Wars was originally scheduled to be released in 2000, and was released as GARM WARS The Last Druid in 2015. Do you have other ideas in your mind, that you want to create and release at all costs? I have them a lot. But even if I sacrifice my whole life, I can't shoot all of them, haha. There are lots of ideas inside my hard disks, and I want to shoot this, that and the other, but what I want to shoot is different from what I can shoot. I'm a stubborn person, so I think I created many works. But I've never thought that I can shoot everything, and when I shoot one film, related ideas would fade away and another idea would come out too. Some directors say "I shoot what I want one after another, and I had enough. ", but I think those people don't have their idea from the beginning. On the other hand, I ceased thinking what I want to shoot, I rather want to shoot as I please whatever someone asks me to. It's easier and more pleasant to shoot a heaven-sent idea, and everyone will be happy. I won't search my old idea from my hard disks and tell someone "I want to shoot this" any longer. I'm not interested in showing my ideas to the others. You continue creating things, like shooting a film, and writing an essay and a novel. How do you get inspiration? Fundamentally I refer to what I learned before certain period of my life. I've heard that you saw a thousand movies per year when you were at a university. Is that what you are saying? Yes, but for the last decade, I rarely feel "I want to create these kinds of movie" after I saw a movie. I seldom saw a movie lately, and it is the most pleasant time for me when I read books. Sometimes an idea comes to me when reading books. In fact, I start to think only when someone tell me to do, and I think that will do. If someone gives me a subject, something will come out automatically from my large stock of knowledge. Nowadays I don't think hard nor learn new things intentionally. I often did such things before, but now I am rather motivated by meeting people, like "I want to work with this cameraman, or this actress." I'm not interested in writing a new plan unless someone asks me to do... I think it's good-for-nothing for me to write a new plan voluntarily. My plan will make sense if someone told me to write it. But I seldom write a new plan these days. The Next Generation -Patlabor- is a combination of short episode and feature film. Did you submit that proposal? This combination was planned from the beginning, talking with producer. They would make the film after finishing the short episode series, so they want me to direct both the episode series and the film. When did you talk about it? In 2011, you wrote a novel "Ban-kuruwase" which is set in the time of third generation of Special Vehicle Section 2, same as this film. We talked after I wrote "Ban-kuruwase", maybe it was in the first half of 2012. In the beginning of production, we've started from the conversation: "Who are you?" "Don't you remember me!? ", haha. 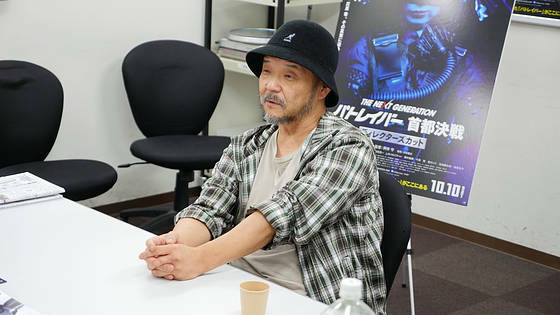 The producer said "I was a producer when we created Patlabor 2!" and I said "Oh! We both have totally changed." Since we both knew each other what we want to create, so we just talked "Can I do this? ", and "Yes, go ahead." Those were all we talked, so it was an unusual work. This will be the last question. When Urusei Yatsura 2: Beautiful Dreamer was released in 1984, you had a talk with Hayao Miyazaki who also have just created the film Nausicaä of the Valley of the Wind. He said "These days the world is flooded with animes. 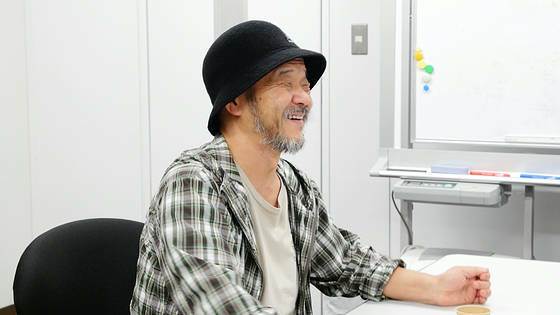 ", and you said that you also played a part in animation industry, because you directed many animes in those days. Nowadays, 50 and more animes are on the air per week, and the anime flood seems to become worse. 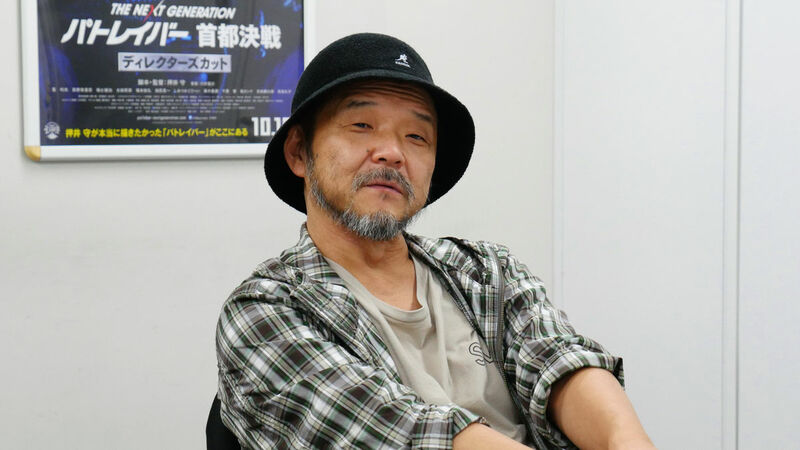 Since you have had enough experience through creating Urusei Yatsura, you left an anime production site, and do you want to say anything about current status of the anime industry? Umm... I don't see animes at all, so I don't know what to say. If there are great production sites, I would hear a rumor or they would come in my sight. I think there is no such sites because I don't hear or see them. Don't you hear any rumors from production sites of animes? Umm... I only saw Puella Magi Madoka Magica. I didn't go to the theater, but I saw it on TV. I thought the staffs were doing well, and the story was interesting. But I didn't feel like I was sorry...umm, I think they are doing well and it's a remarkable thing. And I also think that "Are you still creating these kind of things? Enough already." haha. At the age of 64, I don't know well what I'm not interested in. In fact, TV anime is the most faraway world for me. Therefore, on this point those people at studios saying "You don't belong to the anime industry any more." are maybe true. They have said it to me for a long time, since I was creating Ghost in the Shell, haha. I'm not sure where I belong to. When I work at the production site, I feel like I'm a animation director in some degree, or someone say so to me, but I think anything will be fine for the last decade. Because I've created the same number of animes and live action films, and the latter is rather increasing. I don't mind whatever people call me, I just want to create films. Both anime and live action are acceptable. But I'm not interested in making TV series, because it's not a film. I see. Thank you very much for taking the time today.